One of the main reasons to go to Chelsea Flower Show is to look at the Show Gardens. Here is a quick run around some of them. Let us start with Chris Beardshaw's garden for Arthritis Research UK. A much publicised and highly personal garden for Chris. It is beautifully planted and uses sculpture to good and fairly understated effect. I think no one would say it would break any new ground in garden design, but that is not a criticism; it is a great example of this kind of garden and not surprisingly won the Peoples Choice Award. This type of garden does well as people want the plants in their garden and the style does not challenge how they feel about their gardens, it gives them plant lust. I suffer from plant lust, I would be so happy if I could grow echiums and have them successfully flower. I live a little too northerly for that I think. The M&G Centenary Garden, 'Windows through time', designed by Roger Platts. Again this was not show-stopping new design, but incredibly well planted and this circular sculpture at the front of the garden was simple, elegant and a bit of a show-stopper in my opinion. It also won gold, actually most of the show gardens did. It could be suggested that this means that they give away too many golds, but maybe it reflects the amount of time, energy and let's face it, with the enormous amount of money that goes into these gardens now. With the huge amount of resources that can be thrown at a garden given sufficient sponsorship it is no wonder that an incredibly high standard can be achieved. The B&Q Sentebale 'Forget me not' Garden, designed by Jinny Blom, which won a silver-gilt medal, or a 'not quite'. I think it is a not quite, the planting I really liked but it was overwhelmed by the hard landscaping and almost easy to overlook. So, whilst having just said that resources matter, actually you do have to deliver something that works. The garden received a huge amount of press due to the involvement of Prince Harry, but in reality I did not think it matched up to the hype. The East Village Garden, designed by Balston Agius Ltd. A theme is developing here, yes, great planting, loved the planting - loved the swirl of Zantedeschia and particularly how it worked with the glass swirl behind. The ferns were a delight (Yes, plant lust alert, I'm having a bit of thing about ferns at the moment so I love seeing them so well used.) The colours worked well together, it was a good garden and again a gold medal winner. The Brewin Dolphin Garden designed by Robert Myers, this contained a good use of giant sugared almonds as seats and some probably very expensive but not as nice white seats. It won a gold medal yet somehow for me it did not quite work. It was like all the bits worked well on their own, but were not quite playing as a team. The sunken garden if looked at on its own worked well, but within this garden it did not seem to fit in comfortably. Clearly however this was just me as it also won a gold and the planting was excellent. Great pleaching, I loved the pleaching. The Laurent Perrier Garden, designed by Ulf Nordfjell won first prize in ensuring that a celebrity in a coat that matches your planting is photographed in your garden. 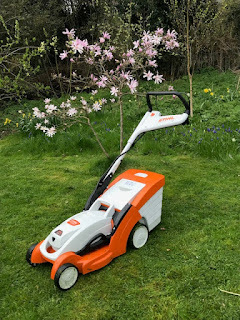 This prize was shared by Kirstie Allsopp who won first prize in finding a garden that matched her coat, and may I just say it was a very very good coat. and finally, The Telegraph Garden designed by Christopher Bradley-Hole, which I can best describe as hedgy. It won a gold, the planting between the hedges was superb and I do admire a nice bit of hedging, but, but, it was a bit too hedgy for me. I say 'and finally', I should say that's it for now, I will be writing another post on more show gardens, there will be episode 2. I love the "Windows through time" garden! You certainly can have too many hedges. I guess that's the difference between a gardener and a garden designer. I'm a gardener! I'd be happy to have a few of those concrete 'sugared almonds' though. Lovely to hear your views on the show gardens, Chris Beardshaw's garden and the East Village Garden got the thumbs up from me, others, I'm not too sure about, although it is difficult to judge from watching TV! East Village Garden is one of our favourites and glad that it won gold. And so does Arthritis Research Garden. 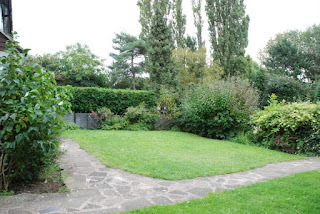 As for the B&Q Sentebale garden, I must admit we haven't read the full brief but what bugged us the most is that there are no linking pathways (and are you supposed to jump into the middle bit? ).